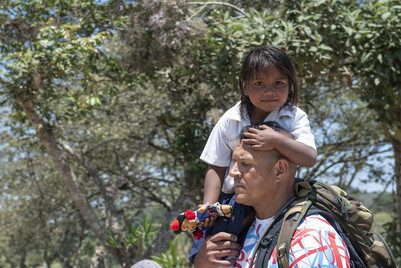 Approximately 128 members of Soto Cano Air Base hiked into the mountains of La Paz, Honduras, during Chapel Hike 78, March 30. Most volunteers carried around 25 pounds of food to hand out to families of a community in need as part of the Chapel Hike, an ongoing community outreach project. Staff Sgt. Bradley Litke, J1 personnel noncommissioned officer, said he volunteered for the event to help and give back to the country he is staying in. The JTF-Bravo Chapel Hike began in 2007 with a group of friends who were planning a weekend hike and decided to bring along some unused food to prevent it from going to waste. Lt. Col. Chad Bellamy, who was in that group of friends and was also the JTF-Bravo chaplain at the time, said there are moments in life that are divinely inspired and although they did not know it then, that was one of those times. What started as a small way to help the community and embrace the Air Force core value of “service before self” has continued for over a decade with no end in sight. The project is currently funded from an Army Chief of Chaplains grant and communities are chosen with the help of the J9 civil affairs directorate who cross-reference with other humanitarian institutions to find areas that are not currently being assisted. After the hike up into the hills, the volunteers spent time with the community playing soccer and helping the children play with piñatas in addition to watching a dance recital from the local schools. Overall, around 6,000 pounds of food was delivered to approximately 200 families. Soccer balls were also donated as part of the Kick for Nick Foundation, a charity in honor of Pfc. Nicholas Madaras, a Soldier who lost his life in Iraq.